Bit of a roller coaster week with ups and downs. I met with the Chief Executive of Surrey CC on Monday morning about the social finance proposals generated by colleagues, and about which two secondees from SCC have been working to assist us. David McNulty had some questions and challenges, but we agreed to go forward with all the projects, which is encouraging. That same afternoon there was a meeting of the various umbrella support service organizations in Surrey – SCA, CVs and us, with Susie Kemp the ACX from the County Council. The core issue is what organisation structure for support services to the voluntary sector in Surrey would you put in place if designing with the a blank sheet of paper? The answer is NOT the current structure. So there will be a workshop with a blank sheet of paper, minus 30% funding and a facilitator to guide us through a process. This will be a challenge for SYF, but also an opportunity. Met with the Surrey Youth Crime Prevention Group colleagues to receive a concluding report on the value of the PAYP and YoF funded projects. Short version is that crime and NEETs do seem to have gone down in the areas where investment and projects have taken place. I have drafted an end of year, looking back/ looking forward letter to our Patrons to go out next week. I am highlighting our good work, but the (terminal) financial challenge for 2012/13, unless we raise income successfully in 2011. Visited a new member organisation- the Amber Foundation – that has a beautiful residential establishment just south of Ockley where they provide accommodation for homeless and unemployed young people who may also have an offending background. Brilliant work …and a 9% re-offending rate compared to a national rate of about 75% + . Also had a great chat with a youth worker wanting to set up a social enterprise…it is the way to go, for some. Personal disclosure: Sat. 5.00pm Twickenham- Les Bleus! Knocked out a 10 mile walk in the cold, rain and mist on the South Downs last Saturday in exactly 3 hours, my benchmark time. Preparing for the charity 26 mile marathon walk on 27 March. b) This week’s question: What is the record time for an Olympic marathon walk (26 miles)? Have a restorative week – end – getting lighter, and enjoy the ( England ) rugby! I went to Duke of Edinburgh Award presentation for Elmbridge last night – 323 young people received awards – which is a great testimony to the continued regard with which the DoE scheme is held, to its supporters, and to the young people. Earlier on Thursday, I had been up to London for a workshop on the “Valuing Infrastructure Programme” about how to measure the impact of support service organizations like us; it was very helpful indeed, but slightly scary to hear about the extent of cuts to CVS all round the country and to national bodies. One of the key learning points was about recognising the different membership market segments, and communicating to them differently in consequence. I am at another evening event tonight to celebrate links between schools and employers-corporates. My interest on behalf of SYF is in making links to employers. I met with the Chairman, Emma Potter and the new Chief Executive of Surrey Clubs for Young People, Joyce Quinnell, on Monday and have established a better understanding of each of our purposes and plans, which should lead to mutual benefit. On the downside we have had to cancel the Faiths in Action event on 23 Feb as we only had 6 people booked in, despite great effort on our part. Youth unemployment is in the national news again, but in Surrey it is still falling, with 2,890 young people 16-24 claiming JSA in December. However I suspect that this may prove to be the bottom of the curve. Next week is the start of a cluster of meetings about social finance and social impact bonds. Personal Disclosure: Off to do a little 10 mile in 3 hours walk on the Sussex Downs this week- end, being my training for the YMCA Charity Y to Y Marathon walk on Sunday 27 March. If you want to know how to get fit/ address diet issues go to www.ooberfit.org.uk where all is explained. Delighted that Mumford and Sons got the Brit Awards for the Best Album – remember where you saw them recommended first! (Here). a) Last week’s answer: New research at Cambridge University shows that fleas can jump 200 times their height, but it is still not known how they achieve this- I thought you’d want to know this! b) This week’s question: Do you understand the Alternative Vote system? Have an enjoyable week- end! A tiring week, with three late nights and one very early start. The impact of cuts nationally is becoming clearer – definitely a time to hold one’s nerve. That was the theme of a RAISE board meeting in London on Tuesday, followed by my own Trustees meeting that evening. My Trustees approved our business plan and budget for next year, and I am delighted we have a clear sense of direction. We know what we have to do to deliver and fund our services. Interesting grant review visit last night for the Community Foundation, Surrey to an independent, residential special school for young people with speech and learning impairments. Amazingly the parents have to spend an average of £20,000 to battle through the appeals and litigation process to get their children to this school. The work of the school was very impressive indeed, and the young people seemed very busy and happy, which was heartwarming. On the downside, we have not had much interest in Faiths in Action event we are to hold on 23 Feb and I will probably have to cancel it. Some learning for me there. And a meeting about social impact bonds with the Chief Executive of Surrey CC had to be postponed for 10 days or so. On the upside I see that a great chunk of Surrey is included as the route for the Olympic Games road cycling race - see www.surrey2012.info. That will be a fun day out. I also see that the number of people required to go through the safeguarding requirements is to be reduced to a more realistic level (from 11 mill people to around 4mill). I attended a breakfast meeting with Michael Gove and others this morning which was very interesting and useful. Personal disclosure: And England beat Wales in Cardiff last Friday - Italy tomorrow! b) This week’s topical question – how far can a flea jump in relation to its size? Enjoy the week- end..it’s getting lighter! I am beginning to see my way through the wintry fog at last. We had a really helpful sub committee of Trustees meeting early in the week, about the Business Plan and Budget for 2011/12 and have a clear direction to recommend to the main meeting of Trustees next week. 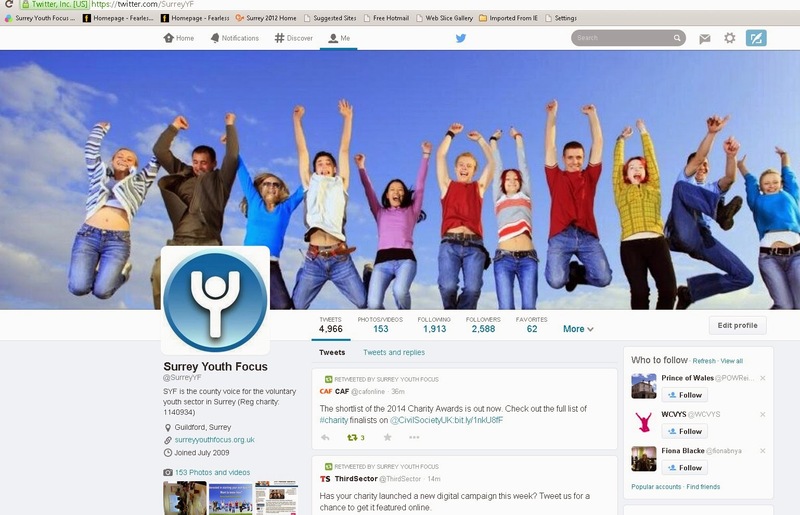 It feels to me as a dinghy sailor like a trimming of sails to face the tough wind, but I am sure Surrey Youth Focus will develop further. For example our membership is going up again, and we are nearly at exactly 80. I have been busy drafting the Business Plan and other reports for Trustees. Also busy promoting our multifaith Faiths in Action event for young people and adults about topical faith issues – on 23 Feb – details on our website, and being advertised on Eagle Radio. It is great having two Surrey CC secondees to work with me on the social finance front, helping our member organizations to develop projects and at the same time to enable County Council managers to identify the unit costs of their corresponding services. This is tricky work both in content and in office politics. The work is preparatory to my meeting with David McNulty (Surrey CC CX) next week when we’ll be setting out the areas of possible projects that will achieve cost savings/benefits, but need external funding. I am in close touch with colleagues at the Community Foundation, Surrey and attended a photographic exhibition in Guildford cathedral of the schemes they have supported that was preceded by choral Evensong. Both the Evensong and the exhibition were very inspiring. Social finance – that is the contribution of the corporate sector - is going to be crucial in filling the gap caused by the decline in government spending. I note the media headline of Surrey CC losing 650 jobs over the next 4 years, which is not as bad as some places – Hampshire 1,200, and CABs in Birmingham being closed, but is always tough. I do discern a growing objection in some quarters to The Big Society; my own view is entirely pragmatic – there will be a gap and the voluntary sector is well placed to fill it. Personal disclosure: I’ll be glued to the TV this evening watching Wales v England (rugby, obviously). I stand in front of the TV for the first 10 minute or so until know the lads have settled down…it does help you know …telepathy to Cardiff….my wife leaves the room! a) Last week’s answer: Rupert Murdoch was cheesed off last week because the News of the World phone tapping scandal looks likely to scupper his bid to takeover all of BSKyB. b) This week: Who has scored the most tries ever playing for England (rugby, obviously) in a single game and in total ?